Stand with Leah activists met with President John Hennessy, Senior University Counsel Lauren Schoenthaler and Vice Provost for Academic Affairs Stephanie Kalfayan on Thursday to speak about sexual assault at Stanford. 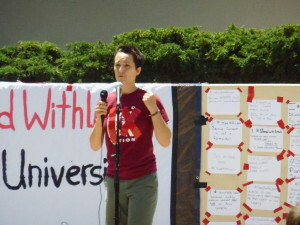 The meeting with the President had been requested “in order to discuss [Leah Francis ’14’s] demands” as well as to understand why Francis, Stand with Leah activists and their faculty supporters were “being excluded from committee membership,” according to a post on the Stand with Leah Facebook page. The group made it clear in its Facebook post that it was unsatisfied with the administrators’ position on certain elements of Francis’ case: namely, the decision to defer Francis’ assailant’s suspension until after his graduation and the time it took for the University to make a ruling and remove the student from campus. On Thursday, the Stand with Leah activists also expressed their concern with the appointments to the Provost’s new faculty-student committee, which was formed last month. The committee will be tasked with improving educational efforts surrounding sexual assault and harassment, as well as studying the University’s disciplinary processes for reported cases. According to activists, the committee included neither sexual assault survivors nor faculty with expertise in the area. The full membership of the committee is not yet known, aside from its co-chairs, Dean of the Law School M. Elizabeth Magill and ASSU President Elizabeth Woodson ’15. However, Hayward said that the other members would be announced shortly. The University expects the committee to solicit input from the Stanford community about ARP reform and handling of sexual assault cases at Stanford. This point was criticized by Stand with Leah supporters as well.